The first, and still foremost, reduced-fat cheddar on the market. These award-winning cheddars will melt in your mouth and on the grill! Just 60 calories and 2.5g fat per 1-oz serving. 1. Combine cheeses and dressing mix; divide evenly among tortillas, spreading to edges. Place three ham slices along center of each tortilla. 2. Roll up tortillas tightly. Wrap in plastic wrap and refrigeratefor at least 1 hour or up to overnight. The best reduced fat cheese on the market. Crumbly at room temperature, creamy when melted. 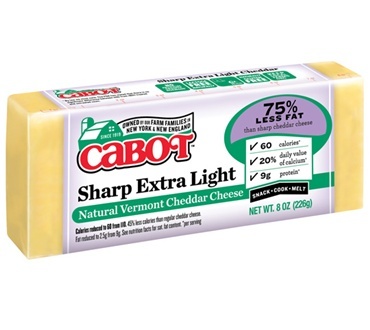 For low fat cheese this has a good texture and flavor. Would recommend to others looking for low fat options.